The Oxford Canal has a unique charm, twisting and turning from the outskirts of Coventry, through glorious tranquil countryside, past picturesque canalside villages to the dreaming spires of Oxford, helping to make it one of the most popular cruising routes in Britain. A tourist map of the Oxford Canal at 1:50,000, showing the entire length of the canal from Oxford to Hawksebury Junction on the Coventry Canal and on to Coventry Basin in the heart of the the city. There are detailed town plans of Oxford, Banbury and Braunston at 1:12,500. 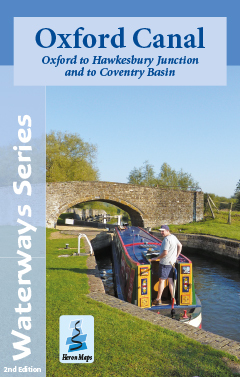 The Oxford Canal map is available to buy online or by telephone from our business partner, Guidepost. Click on the logo below to visit their store.